Author Babs Morton winner of February Paragraphs Of Power won as part of her prize the opportunity to promote any work of her choosing for the entire month of March. So without further ado ... join us as we step into "Bedlam"
Joe loves Kit. Everyone thinks she’s dead. Joe knows she’s not. If you lost the love of your life, how far would you go to get them back? Detective Joe McNeil would do absolutely anything. When Joe breathes life into a crime scene victim, he discovers what anything really means. Nell will use whatever is necessary to ensure she survives, including Joe. Is she really a victim or merely the weapon being wielded by a much more cunning foe? Against the background of a multiple murder investigation, Joe struggles between his love for missing Kit and his growing obsession with the enigmatic Nell. Plunged headlong into a spiralling nightmare of kidnap, murder and betrayal, his relentless search for the truth jeopardises his career, his sanity and his life. But for Nell, the risk is even greater.. I like to mix genres in my novels. 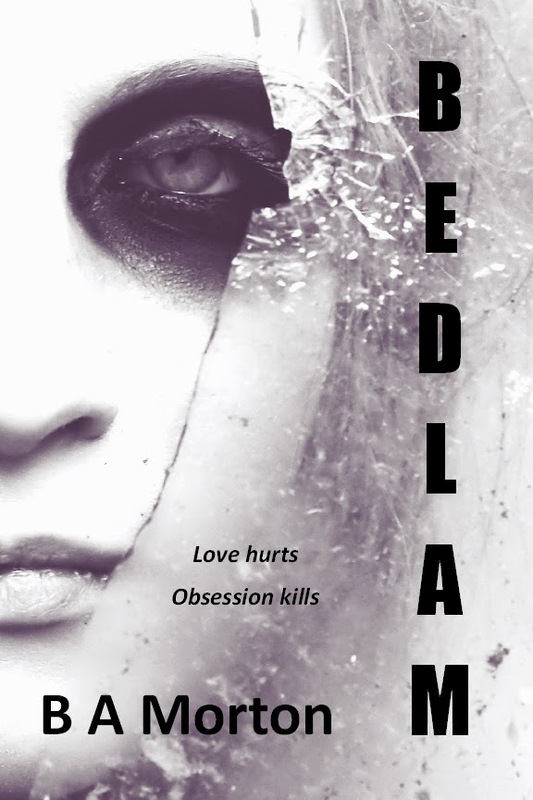 Bedlam is no exception, a crime thriller, with a shuddering of horror. A love story, that’s not a romance. In essence it’s about the games people play to get what they want and it’s about obsession and the danger that accompanies it. So, here they are Joe and Nell ... He loves me. He loves me not. And now, finally, Joe McNeil is within my grasp, though it brings no pleasure to witness his pain, merely shame that I have stooped so low for my own despicable benefit. He stands before me, head bowed, shoulders slumped, depleted of hope, flayed raw and wounded beyond repair, and in him I see a sad reflection of myself, and I cower at my own propensity for evil. I am indeed a product of Jacob’s warped mind, a disciple worthy of his highest honour, and in my selfish greed I have played directly into his hands. I imagine his mirth at how the game progresses and I despair at my inability to turn the tables and influence the outcome. It is a fine balance. I focus now on Joe and concern slithers unbidden into my mind. I wonder if I have made a terrible mistake. His tide of frustration and anger has ebbed through sheer fatigue and hopelessness. His eyes are moist with unshed tears. His heart is broken. I feel the weight of it in my hands. The rhythm is sluggish, without hope there is no reason for it to beat, and I of all creatures should understand this. I have allowed the baring of his soul. Now I must heal him, and when it is done and he is whole again, he will be mine alone, and he will vanquish the beast and all will be well. It has to be. I reach out and this time he does not avoid my touch. Instead he leans in, seeking comfort, and my fingers skim his brow as he did mine what seems like an eternity ago. His skin is warm, unshaven and rough beneath my caress. I trace the contours of his face, the scars that give title to the chapters of his chequered life, and tease his lips softly with the pad of my thumb. He watches me, powerless, tense and expectant as I in turn inhale and devour his scent. “Yes.” I smile at his intake of breath, his inner voice that rages beneath the surface, demanding his attention. He is about to betray his love, and he knows it. You can purchase Bedlam on the following. Thanks for finding room for me, Soooz. It's much appreciated. Fascinating stuff, Babs. I'm not usually a horror fan, but this sounds like something really special. Hi, John and thank you. I am delighted to be back at 'work'...lol. Babs, you are so very welcome. Gerry,Thanks so much for popping in and leaving a comment. I appreciate it.